Loomed absolute as the antique world . 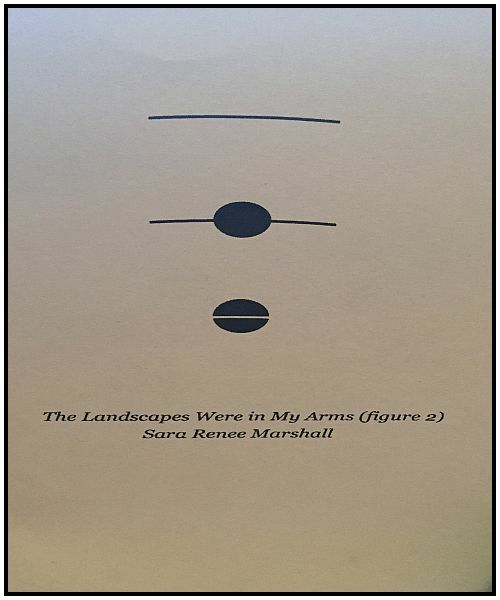 . ."
The Landscapes Were in My Arms (figure 2) by Sara Renee Marshall and above/ground press, is a fantastical progression in Imagist poetry that paints pictures inside and outside Summer rain. Sara Renee Marshall, Poet and student, is studying for her PhD at the University of Georgia, she holds degrees in political science and poetry from the University of Colorado. She is widely published and this is her second Chapbook by above/ground press. This poetry is a classical rendering of old world meets new, with nature imagery interwoven with imagery of the machine age. A celebration of flowers, sky, stars, grass and trees with the idea of the modern in house/home, microphones, static and means of conveyance. There is also the ideal of the artist in painting/photograph imagery and allusions to painters, Delacroix and a quote from Matisse. like a figure and its shadow"
A first-person narrative that travels, painting pictures, particularly focused on the house/home that may be a symbol for her love life. It is almost as if she expects the landscape to move, perhaps eventually a place of departure, the poetry exists as a beautiful expression of the moment, inside sorrow and celebration. This poetry is a brilliant play on work by Sylvia Plath, with a similar classical lilt of sorrow and nature imagery, a truthtelling, a tight weave. A brilliant Chapbook of the New Age Renaissance Republic of Poetry, The Landscapes Were in My Arms (figure 2) by Sara Renee Marshall.